The Jallikattu Bill was passed unanimously on Monday by the TN Assembly after a week-long protest at Chennai's Marina and other parts of the state. 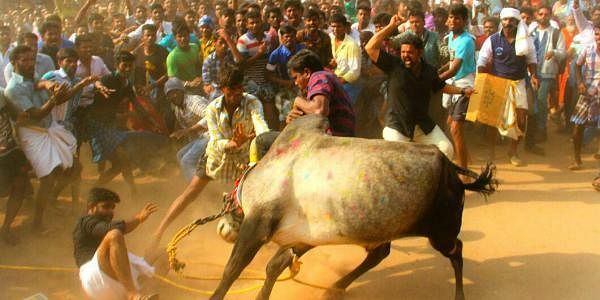 NEW DELHI: Animal Welfare Board of India (AWBI) and other animal rights activists on Wednesday moved Supreme Court challenging the new jallikattu law passed unanimously by the Tamil Nadu Assembly. Senior advocates Abhishek Manu Singhvi and Anand Grover appeared for the Board and the activists before a Bench led by Justice Dipak Misra, which decided to hear their plea likely on Monday when the Justice Rohinton Nariman and he would sit in the bench. On Tuesday, Attorney General Mukul Rohatgi informed the court that the government would file an application seeking the withdrawal of the January 7, 2016 central notification allowing jallikattu in the light of the new Prevention of Cruelty (Tamil Nadu Amendment), 2017, passed by the State Assembly. Almost 70 caveats have been filed by various parties, including the Tamil Nadu government, in the apex court in the past two days in anticipation of a challenge against the new pro-jallikattu law of the State.